A month ago I publicly shamed BBC America by noting they hadn't aired any comedy in weeks, and demonstrated how pear-shaped the whole channel had gone by viciously copying and pasting one full day's purulent schedule. I presume my brutality played some part in BBCA changing their weekday programming in recent weeks. Instead of endless repeats of You Are Eating the Trash in your Attic! and How Clean are your Hotel Inspector's Breasts?, they've begun airing 6-hour blocks of a given prime-time UK program each weekday. They are calling these the "All-Day Marathons"-- without marathon-induced chafing. Monday from 11 a.m. to 5 p.m. eastern will be Torchwood. Tuesday it wil be Robin Hood. While neither program wins Riffle's "I Watch This Unbidden" award, it's a vast improvement over the earlier begging-to-be-euthanized lineup. Maybe a few Americans will stumble upon things they enjoy. 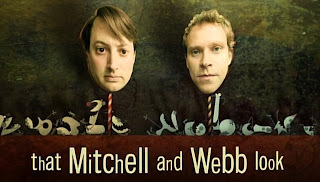 In a flash of astounding Good Sense, they have scheduled That Mitchell and Webb Look on Wednesday, October 7 from 10 a.m. until 4 p.m. Apparently they're airing all six episodes of the first series and the first three episodes of the second series. That Mitchell and Webb Look is the best UK TV sketch show of recent years, with top-flight writers and great comic performers. Set your DVR to record it on Wednesday in the USA, especially since it's not available on DVD here... yet. Let's encourage BBCA to expose the US to the higher quality UK material, and thank them when they do so. BTW, the radio series That Mitchell and Webb Sound has just ended its fourth series on BBC Radio 4. Fortunately, we in the US can still listen to the last episode via BBC iPlayer. The whole series has been splendid, and I'm sorry to see it go.